“With the midterms less than a week away, the Obama administration is getting ready to announce its first big post-election agenda item: immigration relief. President Obama has promised that he’s going to take executive action on immigrationbefore the end of 2014, and rumor has it that the Department of Homeland Security and the Department of Justice will submit their recommendations for what exactly the president should do by early November. Obama’s plan is expected to include relief from deportation for millions of immigrants. The new program might build on the Deferred Action for Childhood Arrivals (DACA) program from 2012, which allowed young immigrants who would have benefited from the DREAM Act to apply for two years of protection from deportation, and for work permits. Or it might take a slightly different form, but one that would still allow some unauthorized immigrants to be protected from deportation, and be allowed to work, without officially giving them legal status. Nothing’s known for sure about what the new immigration program will do — after all, the White House hasn’t made a final decision yet. But here’s what we know they’re considering, and what looks likely to make it into the final package. How many people could be covered? Estimates tend to be in the mid to low millions. Legally speaking,the president could extend deferred action to all 11 million unauthorized immigrants. That would be unprecedented. If he wanted to follow precedent slightly more closely, he could protect all of the 8 million or so unauthorized immigrants who would qualify for legal status under the immigration reform bill the Senate passed last year — just like he used DACA to protect would-be DREAM Act beneficiaries after the DREAM Act failed. But most policymakers are expecting the plan to help a smaller subset of immigrants. Rep. Luis Gutierrez (D-IL), the biggest Congressional advocate for executive action on immigration, has said that “three, four, maybe even five million” immigrants could be protected when President Obama acts. It all depends on who exactly is included in the new program, which no one knows for sure at this point. Which types of immigrants could be covered? The president’s ability to protect unauthorized immigrants from deportation is supposed to be limited to particularly worthy cases. When the Obama administration instituted the DACA program in 2012, they justified it by saying that they were limiting the program to a particular group of immigrants — and then using the application process to evaluate individual cases. Unauthorized immigrants who are married to US citizens or green-card holders. There are 1.5 million unauthorized immigrants in the US whose spouses have US citizenship, or at least a green card. These immigrants should be eligible for legal status themselves, but are blocked by rules that make it extremely difficult to get legal status in the US if you’ve ever been unauthorized — especially if you’re not willing to risk leaving the US in the hopes that you might get to come back. 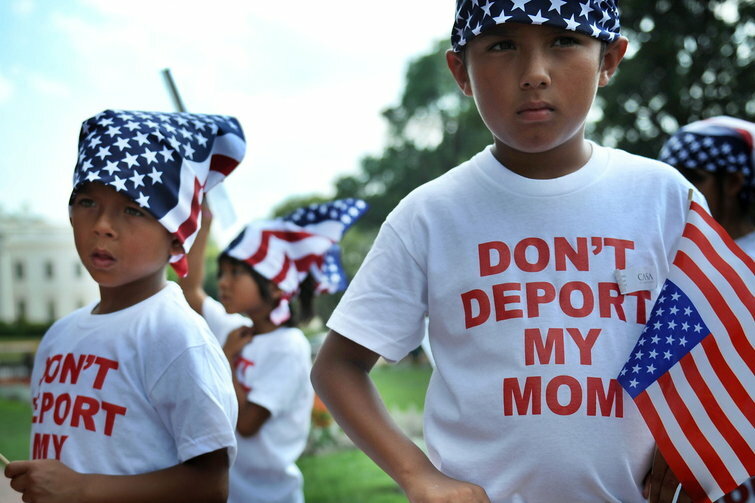 Unauthorized immigrants whose children are US citizens. There are 3.8 million unauthorized immigrants with US-citizen children (in most cases because their kids were born in the US). These immigrants can’t get legal status until their children turn 21 — and would then have to deal with the same rules that make it so tough for unauthorized immigrants in the US to get legal status. Other unauthorized immigrants with children. The Obama administration has said that immigration enforcement shouldn’t split up families, and advocates believe that the only way to guarantee that is to protect parents from deportation. There are 900,000 unauthorized immigrants whose children are not citizens, but are under 18. The administration could also protect the parents of DACA recipients, which could cover several hundred thousand more unauthorized immigrants. According to Buzzfeed, advocates aren’t sure whether the Department of Homeland Security is including parents of DACA recipients in its recommendations for relief. Farmworkers. Historically, legalizing unauthorized farmworkers has been more popular with Congress than legalizing other unauthorized workers — a bill called “AgJOBS,” to grant legal status to farmworkers, has been floating around Congress as long as the DREAM Act. In an op-ed published in Univision, Democratic members of Congress, including Minority Leader Nancy Pelosi, argued that Obama “could recognize that it is ‘essential for agriculture’ that farmworkers who toil in our fields do so without fear” as part of his executive action. What other requirements would an immigrant have to meet? Immigrants won’t automatically qualify for legal status if they fit one of these categories. There are other criteria to consider as well. To qualify for DACA, for example, an immigrant has to meet a set of criteria regarding age, education, criminal record, and time in the United States. Not all of those will matter for other groups of immigrants (age requirements will likely be dropped) but others will. In particular, the administration is expected to require applicants to have been in the US for a certain number of years before they’re eligible for relief. The DACA program required immigrants to have been in the US since at least 2007 — five years before the program went into effect. The new policy similarly could say that immigrants have to have lived in the US for at least five years — or it could say they have to have lived in the US for at least ten years, or some other number. Advocates are very worried that if the administration limits the program to immigrants who have lived in the US since 2004, will disqualify millions of people, enough to seriously blunt the impact of the program. While most unauthorized immigrants have lived in the US for over a decade, some are newer arrivals — or have left the US and returned at some point in the last ten years. Furthermore, it’s going to be extremely hard for immigrants to prove when they entered the country without papers. How is the GOP reacting to the possibility of Obama acting on immigration on his own? Republicans are already mobilizing against executive action on immigration — even before the Obama administration announces any new changes. And the president’s delay until after the elections hasn’t calmed them down at all. When the administration initially announced its Deferred Action for Childhood Arrivals (DACA) program in 2012, there wasn’t much Republican opposition. As a bigger immigration-relief program has become a possibility, though, Republicans have turned against DACA as a way to signal their opposition to Obama taking another executive action. In August, the House voted not only to end the DACA program for new applicants, but to strip protection from immigrants who currently have DACA status. And in September, the Senate narrowly defeated n amendment to a continuing resolution to fund the government that would have ended the DACA program (but would have only stripped work permits, not deportation protection, from current DACA recipients). It’s not clear how much effort the GOP will go to to stop further administrative action from happening, however. Brian Beutler of the New Republic points out that, since the legal standing for Obama’s anticipated actions is pretty solid, it’s unlikely the GOP would be able to use the courts. So the only way to keep Priebus’ promise is to engage in the kind of legislative brinkmanship — like threats to defund the government — that McCarthy wants to avoid. Rep. Steve King (R-IA), a longtime supporter of maximizing deportations of unauthorized immigrants, says that he’ll call for impeachment hearings in the House if Obama makes a big move. King doesn’t always have the ear of his caucus when it comes to immigration — but when the House passed its bills this summer, caucus leaders went to him for final approval of the text. So his calls for impeachment could be influential.